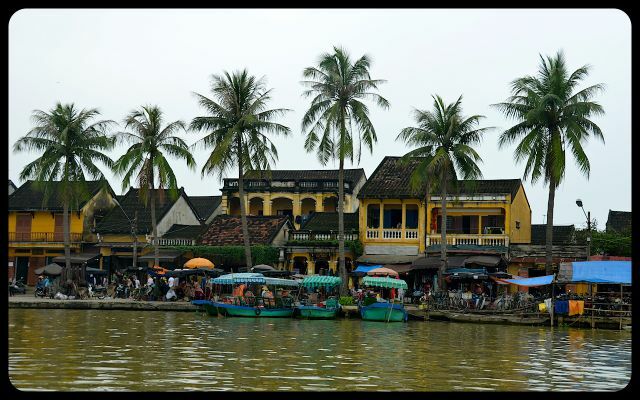 Along Hoi An, Vietnam’s riverside, numerous boat owners offer to rent their wooden vessels for journeys of an hour or more. 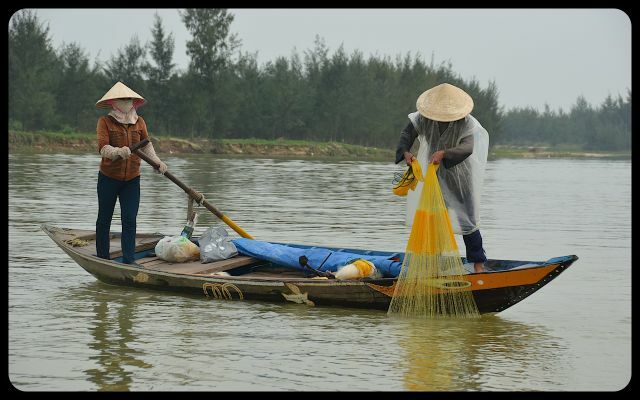 Since Hoi An’s coastal position afforded it such a great trading fortune in centuries past, we were eager to explore the Mekong’s waters by boat. 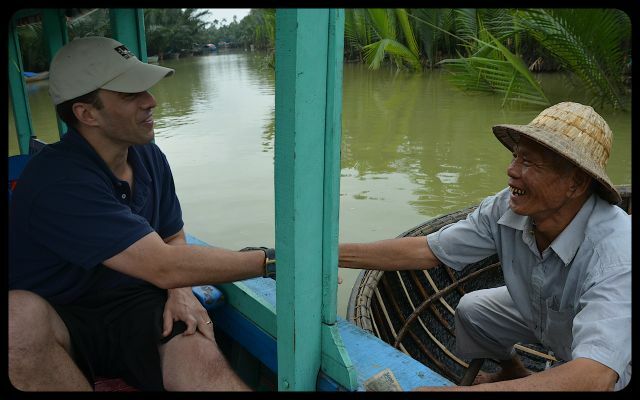 With a Vietnamese dong rate negotiated, we hopped onto the watercraft. The last morsels of a bundle of incense sticks burned at the helm, honoring the spirits and expressing the driver’s and passengers’ wishes for a safe voyage. Like most boats in the region, a primitive eye was painted on the bow – designed to ward off evil spirits and to find the way. 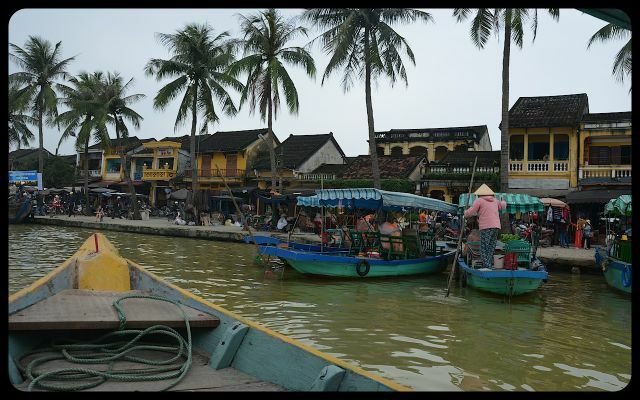 Unlike Hoi An’s bustling marketplaces and tourist districts, the waterways were tranquil. 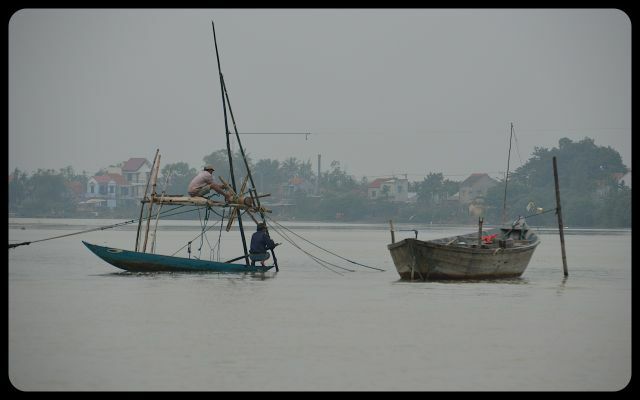 The overcast sky lended comforting hues to the Mekong’s waters. It was fascinating to watch the action on land from the water. Two teenage boys rode a bicycle in front of a saffron home’s front. An elderly woman dipped a bucket at the water’s edge. 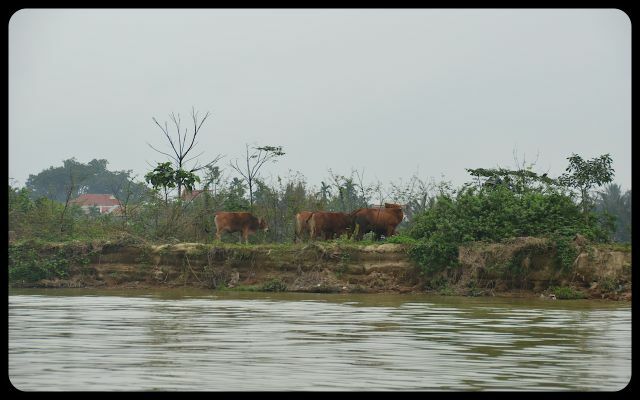 Water buffalos waded through the water. 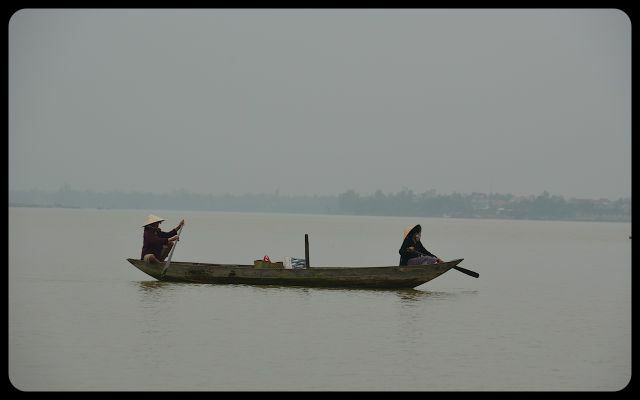 Two ladies, piloting a boat and wearing nón lá hats (or ‘leaf hat’), gracefully glided by. Just as I had entered a relaxed state, an opportunity for adventure arose. 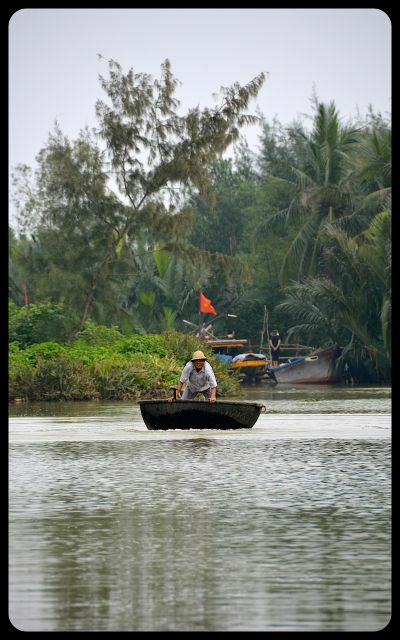 Before us was a charismatic local man paddling a basket boat. 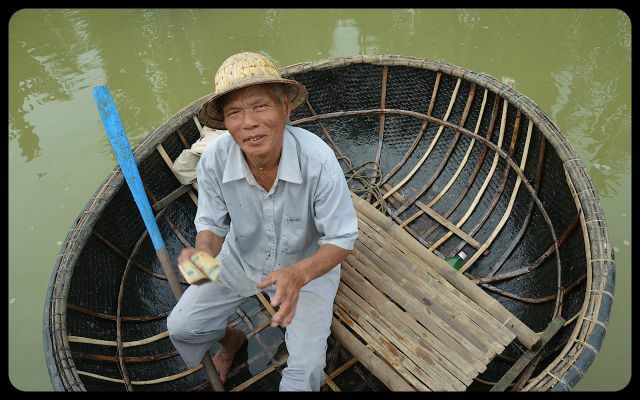 He playfully splashed his oar in the water, pretending to tip the basket boat deep into the water. He then saluted us. 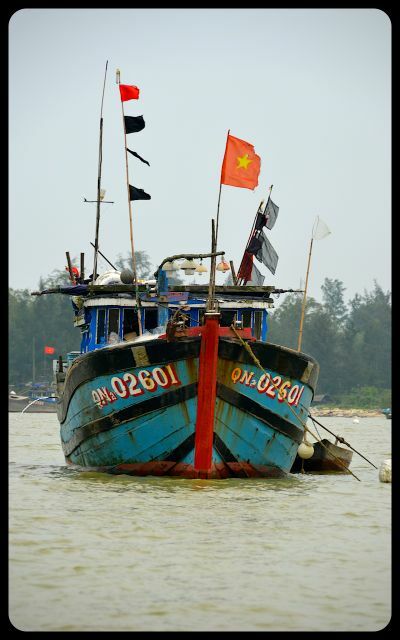 In the background, Vietnam’s red flag – adorned only with a bright yellow star – flitted in the wind. “I want to ride in the basket boat!” I exclaimed to Shawn, flashing the puppy dog eyes of a little girl at him. “I’m afraid you’ll fall in,” Shawn replied. “Is that basket sea worthy?” he asked. But it was too late. 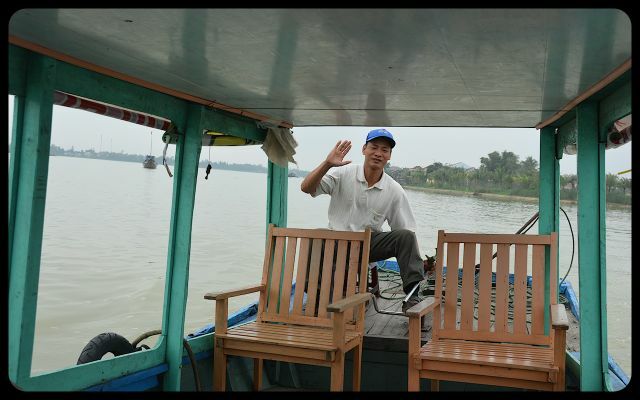 The energetic boat’s navigator had rowed his boat to meet ours. 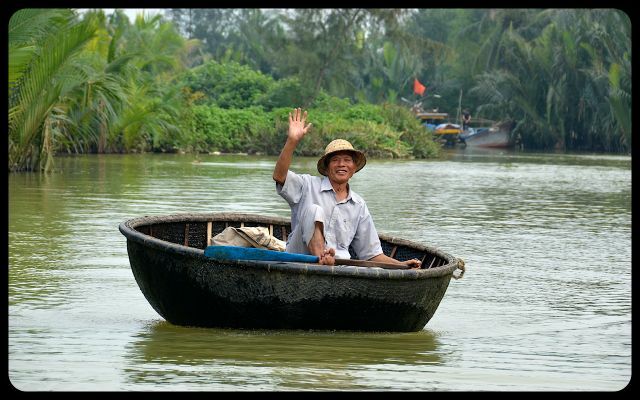 With a wave of his hand ushering me in, I knew that I had the unique opportunity to ride in a Vietnamese basket boat. And I indulged with great gusto. 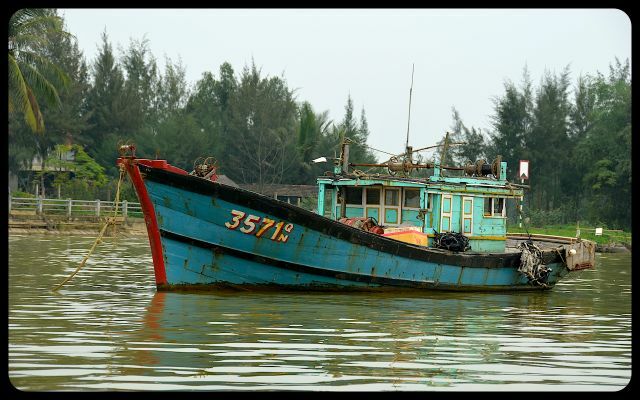 As Shawn chuckled, our boat’s driver chivalrously held my hand as I tiptoed onto the unsteady vessel. 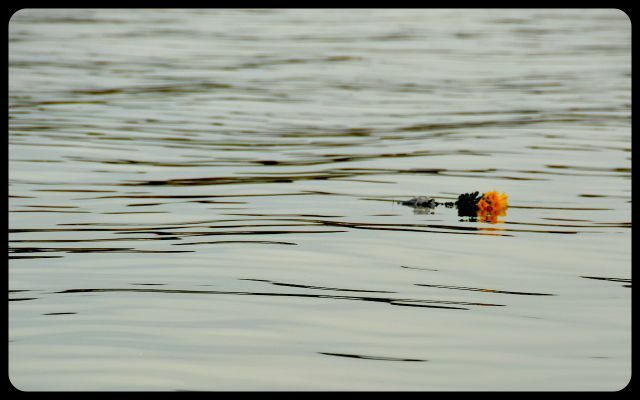 Small trickles of water ran along the bottom of the boat, cooling my bare toes. 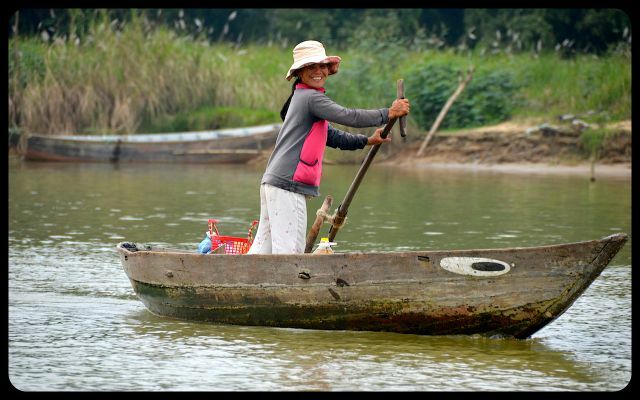 The basket boat’s impish driver clapped his hands energetically as I sat inside. The boat took a few dramatic dips before I realized how to ride gracefully in it. Within seconds we were off. 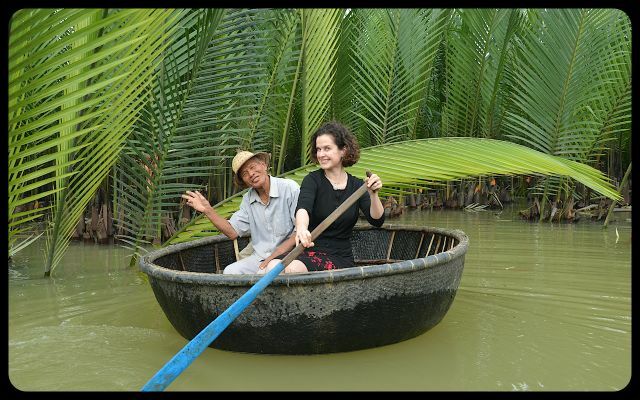 Sensing my desire to command the boat basket, the driver handed me the oar. I enthusiastically paddled and the boat shot around 360 degrees. The driver continued to madly applaud, as if I had just finished a grand operatic performance. 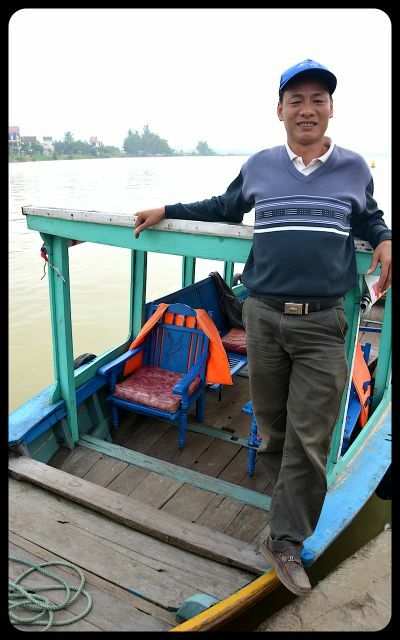 In Vietnamese, he prodded me to modify my rowing technique. 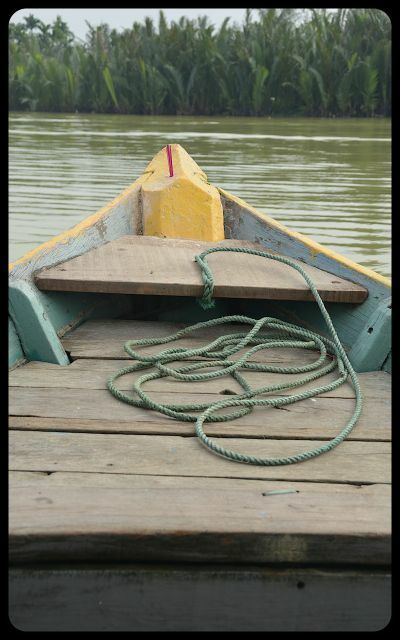 When he rowed, the boat inched forward. When I was at the helm, it spun around in choppy circles. Before I knew it, I was sporting the driver’s woven hat. Though we could not understand each other’s language, the gift of universal laughter filled the void. 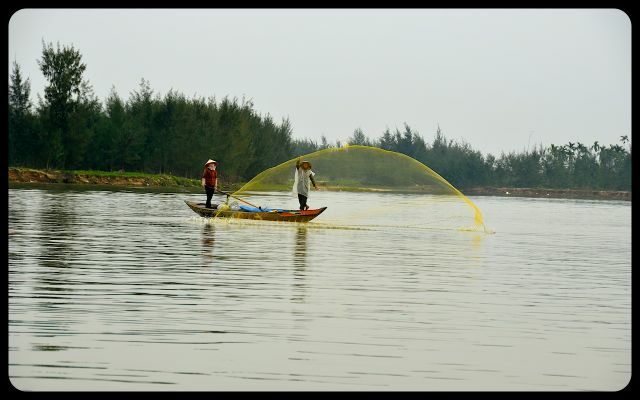 During the return to Hoi An’s city center, we floated past a couple dramatically casting a net into the water. 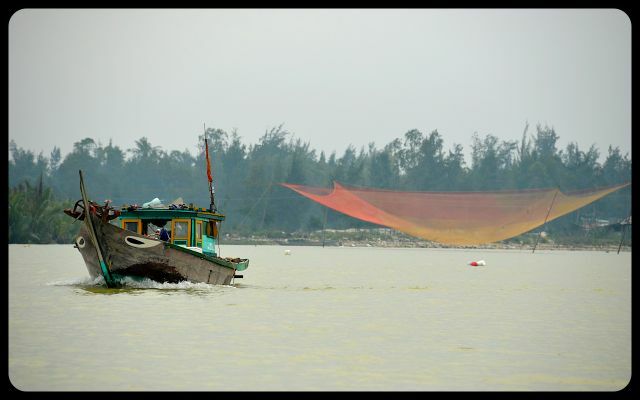 We also encountered Chinese fishing nets that were waiting to be dipped into the water for an early evening catch. They stood with impressive posture. 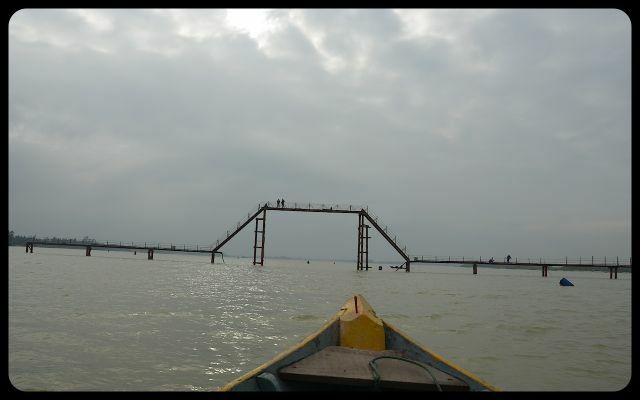 Then we saw the early stages of a bridge; the engineers waved to us in a proud manner as we passed underneath. 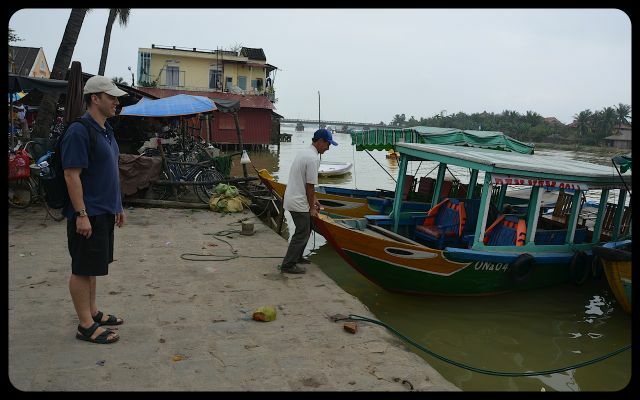 Soon, our boat had returned to the bustling port of Hoi An. Our driver bid us farewell and off we walked onto the lively streetscape as fruit vendors offered us vibrant rambutans and mangosteens out of overflowing baskets. 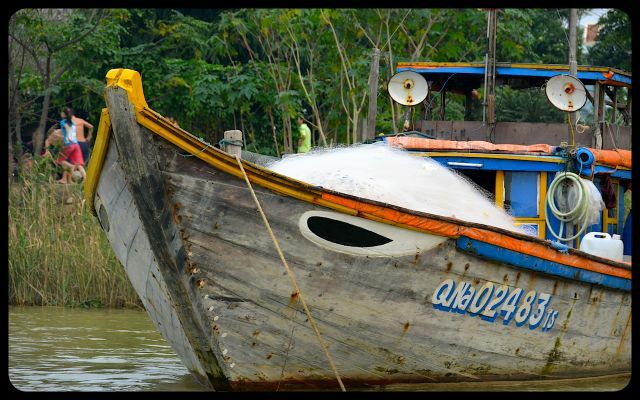 Indeed, I’ll never look at baskets – or boats – in quite the same manner following that afternoon floating in traditional and unconventional vessels! Thank you, Cornelia. We were definitely in the right spot of that waterway at the right time – allowing us to meet that charismatic Vietnamese fellow :) Have the blooms started emerging in Heidelberg yet? Yes, the blooms just started. It’s quite warm and sunny, the “Neckarwiese” is crowded with people. Sounds lovely, Cornelia; we’ll be back for a visit in just a few weeks. It seems we’ll miss the Heidelberg Spring concert series this year – attending it had been a tradition for many years! Maybe we can meet for a coffee at Theaterplatz when you are around. That would be fun, Cornelia! We should be in Germany in the coming days, however, will be splitting the time between business in HD and visiting family in Bavaria. Let’s stay in touch. Wow! I really love your blog, Tricia! This post looks so fun! I am sure you leave footprints on the heart of those people you meet. I found myself smiling when reading this one – at your basket boat antics. 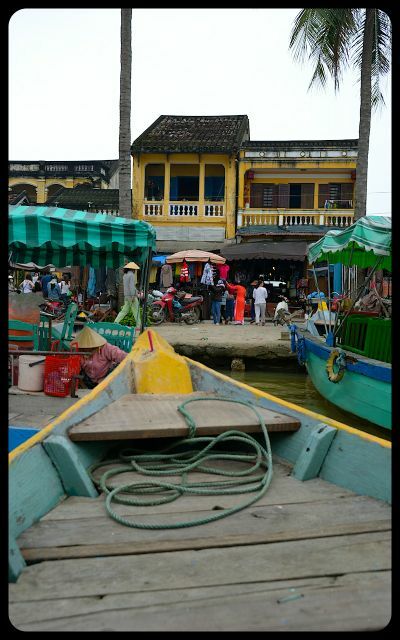 Great photos as usual, love the colours of the houses and boats. 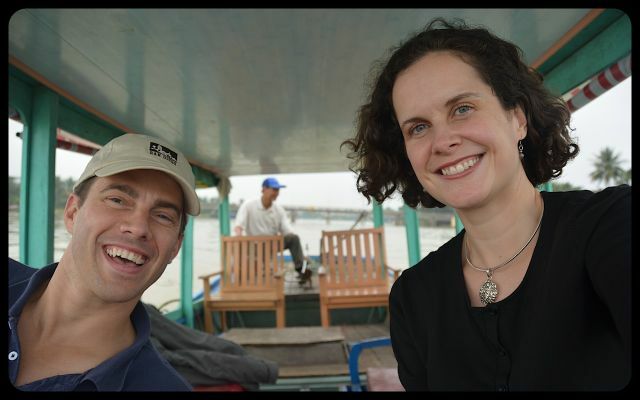 :-) It’s a delight being around such mischievous souls such as this boat driver! The playful spirit is indeed contagious. Glad you enjoyed the tale, Jane, and hope your home is starting to see spring’s return! Glad you enjoyed it, Travelbunny! Safe travels to Talinn and enjoy your time there – it’s such a lovely city! It’ll be fun to see your impressions of it through your images. A super story. 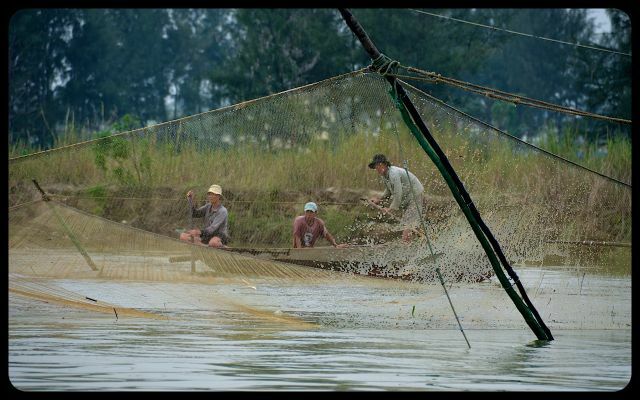 I love those shots of the girls tossing their net. 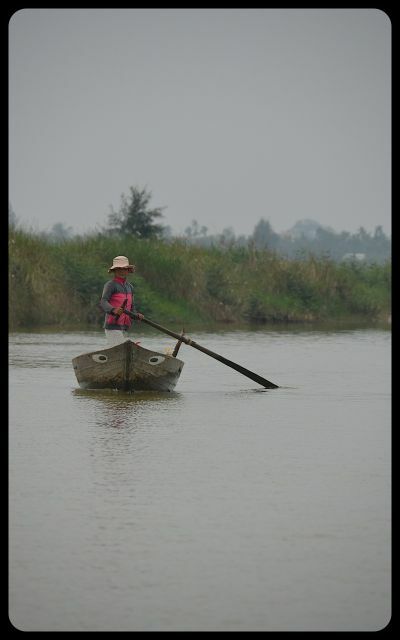 The basket boat reminds me of coracles which I gather are equally hard to steer! Many thanks, David! I have such fond memories of that afternoon. My pleasure, Steph! I’m pleased that I found you via your Kopi Luwak article. And, here’s hoping that you’ll make it to Vietnam sometime soon. If you do, I’d be happy to share some pointers from my two visits there. Being there to celebrate the Vietnamese New Year in 2009 was quite a treat! So many cultural practices to observe. I will definitely ask for your advice when I (hopefully) visit Vietnam soon. I taught an American Literature course to high school students, and I did a unit on the Vietnam (American) War for which we read The Things They Carried by Tim O’Brien. 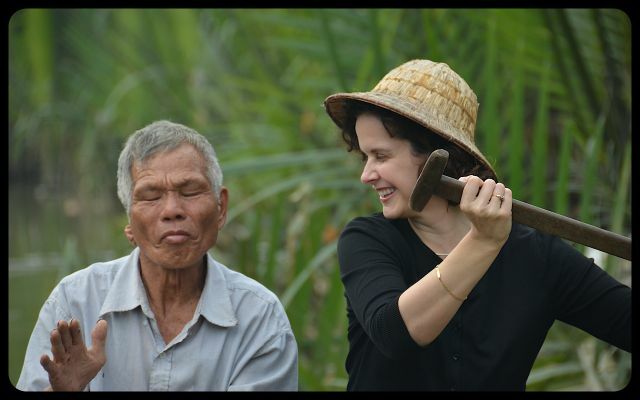 I challenged students to look at every perspective of the war including the Vietnamese villagers and the VC soldiers. 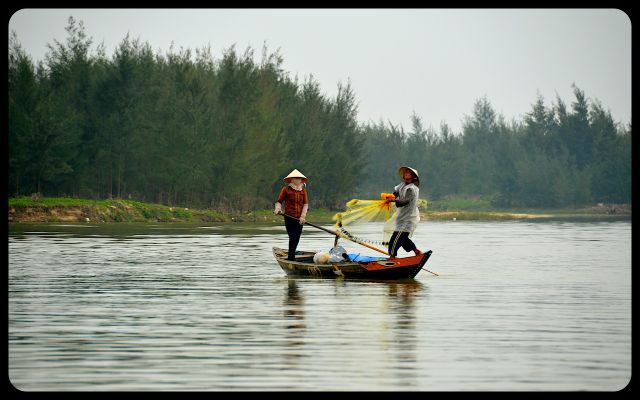 I so wish to travel to Vietnam, so I can bring back insights on Vietnamese culture and history. Thank you for sharing your wonderful posts, Tricai. I hope that you will make it to Vietnam soon. 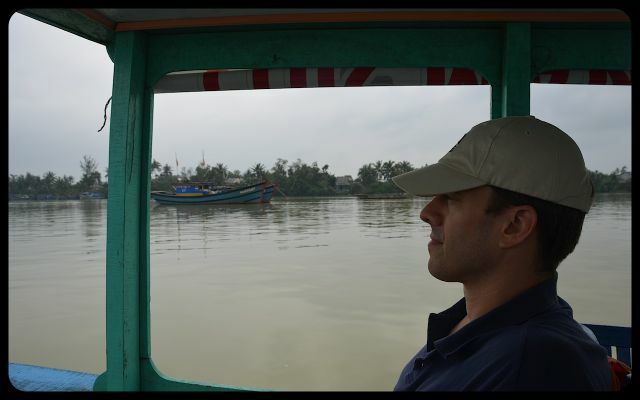 I find that travel makes history and concepts come ‘full-circle.’ I visited Hanoi and Ha Long Bay in early 2009, then went to Washington D.C. later that year. When I visited the Vietnam Memorial, I certainly felt that I had acquired rich perspectives as a result of my travels. As I photographed the monument, a tour guide approached me and said I must listen to the anecdote he’d be sharing with his group in a moment. (It was a touching story about a fallen soldier and his devoted pet dog in Vietnam.) 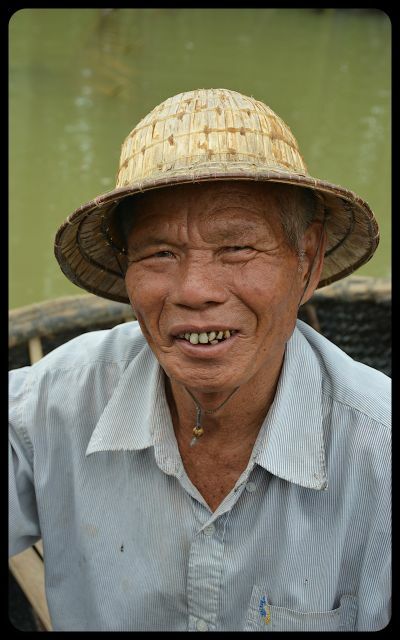 The guide was surprised to hear that I’d just been to Vietnam and was fascinated to hear about my interactions with the people. During both of my visits, I’ve been struck by how kind the people were, despite the war. 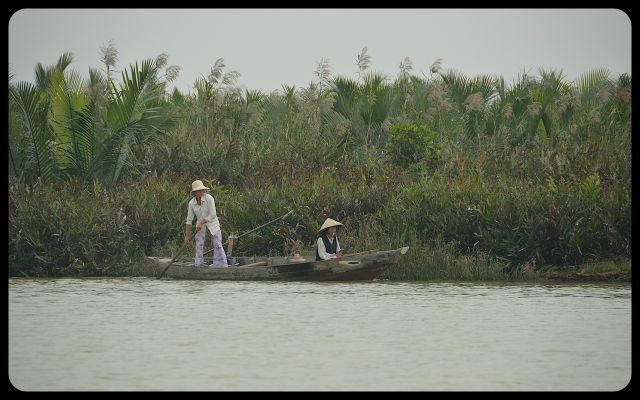 We found Hué particularly interesting. I’m sadly far behind with my posts and have yet to share all my Southeast Asian tales, but I did post about the war memorabilia we saw for sale there. 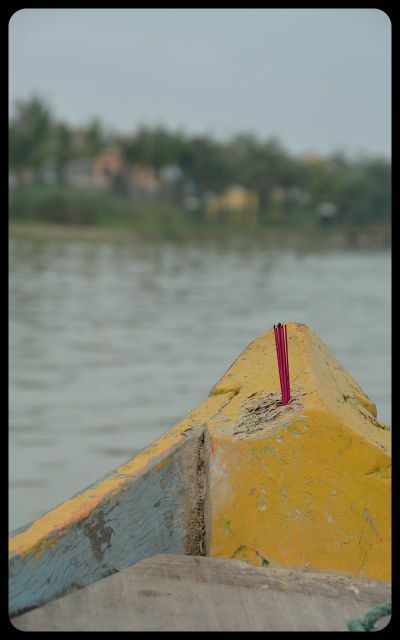 :) I tried this “basket boat” once when I took a trip to Phan Thiết – Mũi Né about 2 years ago, we call this “thuyền thúng” , haha , there was no boatman to give us a hand , so I and my friend just decided to push one pretty boat straight to the sea and climb in without any help – then “BOOP”- the boat-kept on floating to the sea – and we – tried swimming back to the land ! 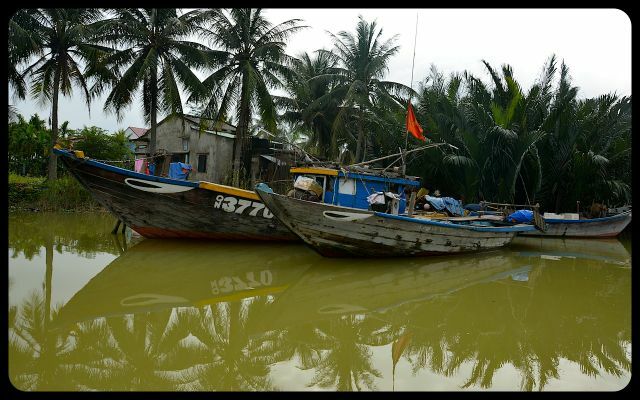 Yinyin, it’s interesting to know the official name of the boat now… thuyền thúng. Thanks for sharing this cultural piece of information with me. You are more than welcome ^ – ^ !This little name is nothing in comparision with those information that I have learnt from your blog ! ^ – ^ I often spend about one or two weeks per year visting some new places and doing crazy things with my friend. I don’t know but I do feel that sharing a long trip with only one or two good friends seems better than with a huge group of companies. 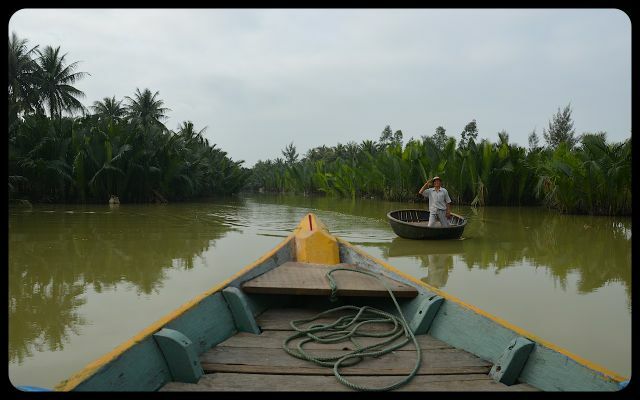 On the way from Phan Thiết to Mũi Né, we also found a very interesting spot – the fairy stream – or they call it "suối tiên" ! You sure will love this place, Tricia ^ – ^ (or I hope you will). Climb down from a very normal-looking brigde then you may find youself standing at the start of a narrow stream which is covered by 2 walls of trees. ah I forget to tell you this ^ – ^ I’m so happy you like ny country , the way you setting your avatar make me feel so proud !Thanks so much ! What a nice thing to say, Yinyin. 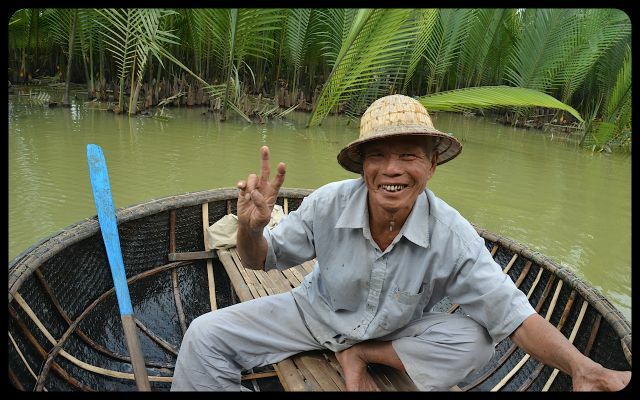 It was because of friendly people like you that we enjoyed our time in Vietnam so much! 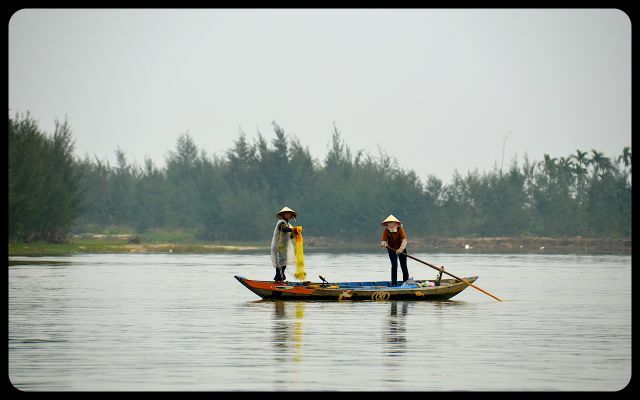 Ohhh man I want to visit Vietnam so much! Even more, if that’s possible, by visiting here! Looks so amazing. Next is New Zealand in 2 months! But Vietnam is on my Dreams list. I can’t wait to go there! Your pics are amazing! I have a WordPress question for you, if you don’t mind. In your posts, how do you get multiple post shortcuts in one page? For your post Canada, for instance, when you click Canada, I see you have a shortcut for Ottawa and Toronto in the same post. How do you do that! I can’t figure it out! I can only figure out how to get both their full text versions in there. Hi Alli, I don’t mind at all. I’m not sure if I understand your question exactly, but I’ll try to help. Is it the Canada page under the Travel menu that you’re trying to replicate? If so, I did that index manually. Yes! Thank you so much! Ahh I was trying to figure that out forever! 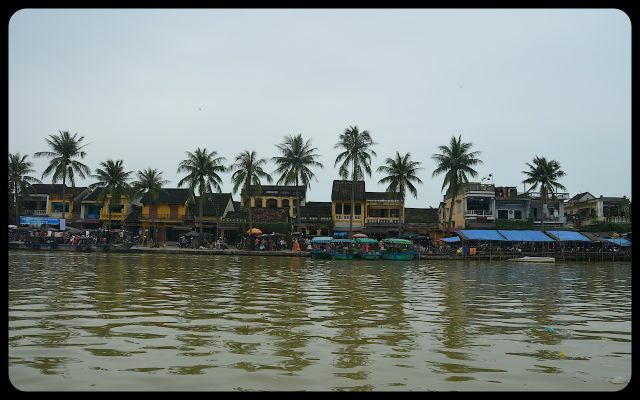 I love all the places that you’ve been, and I really admire your Vietnam experiences. I think you would love the Greek Islands! So, the directions helped? That’s wonderful. 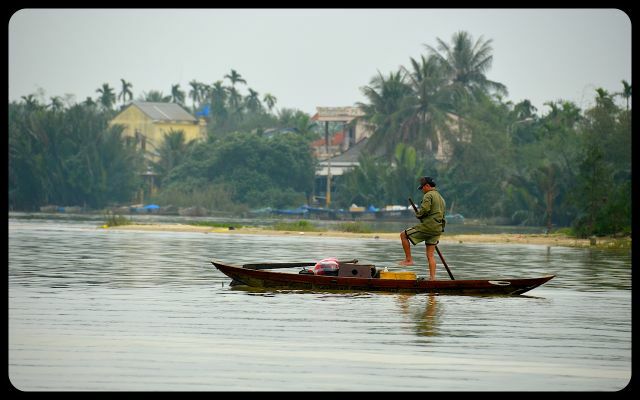 Vietnam was quite lovely. It was my second time there, my husband’s first. 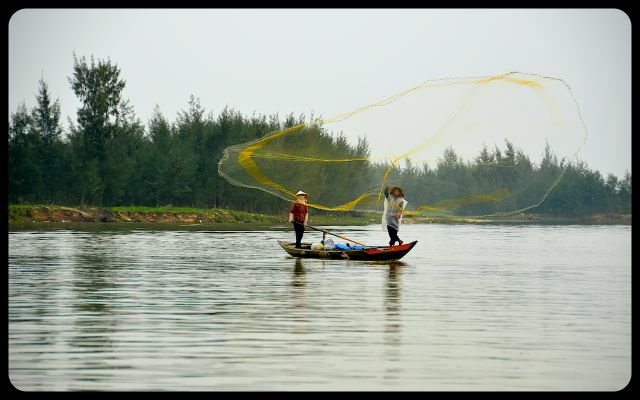 If you can make your trip coincide with Tet (the Vietnamese New Year) that is a fun, cultural time of year to be there! Which Greek islands did you visit? Yes, the directions helped! 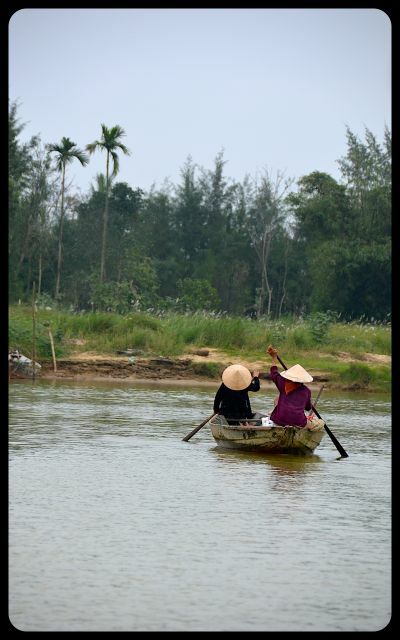 Thanks for the tip on when to visit Vietnam I will have to keep that in mind! I visited Mykonos, Patmos, Rhodes, Santorini, and Crete, but I am also told by a fellow blogger that Amorgos, Folegandros and Serifos are great because they have no airports or deep water ports. Santorini is definitely an absolutely have to see place, it is so pretty, and looks just like stepping into a painting. Fingers crossed that we’ll be able to make it to one – perhaps more – this summer. I appreciate your recommendations, Alli! Did you find Santorini a bit too touristic, or well-worth the hustle and bustle? Because of its beauty I paid no attention to other tourists. There were many other tourists around but it is too insanely beautiful to pass up! 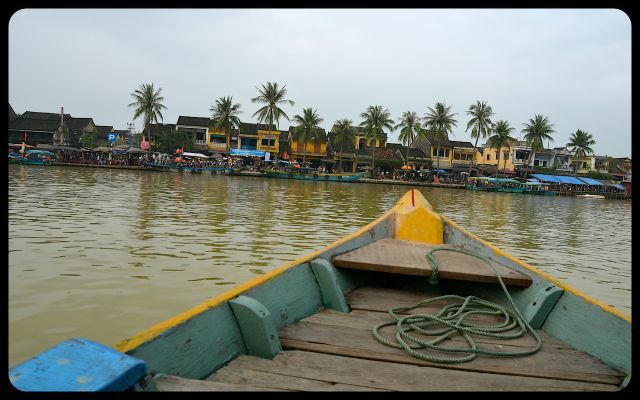 Taking that boat ride was one of the highlights of our time in Hoi An. Somehow the overcast day added to the experience. 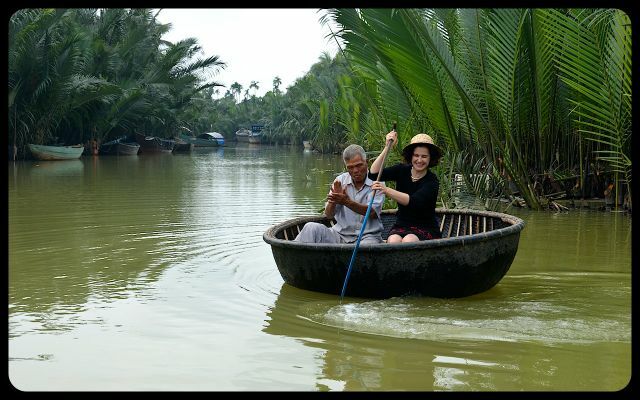 Of course, hopping in the basket boat, and trying – rather unsuccessfully – to navigate it, was something I’ll never forget. 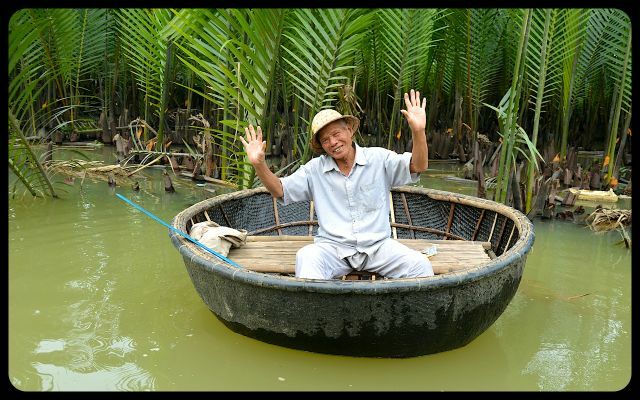 The basket boat’s owner was such a ham. I love how your perhaps normal “tourist” adventure on a boat turned into something truly unique. loved the blow by blow account, and the smiles of the happy folk. Welcome and thanks for dropping in, Kat! Serendipitous events like this one makes travel moments really special and unique.